It’s the end of the year, which means buyers are rushing to use up all their year-end budget, (hey there, favorite The Office clip). Of course, this means salespeople are also hyper-motivated to negotiate to hit that all-important number. As such, steep discounts are often on the table in a way that can feel as thrilling as a 50% off Apple Watch on Cyber Monday. But as we dug in and talked to our community, we found there were two sides of the coin, literally. On the one hand, sometimes vendors will offer a price break to push their number over the line for the year. This is reasonable and it could still be a great product. For example, in the reference above, Apple doesn’t technically discount their technology on Cyber Monday. Instead, they offer you a $200 gift card when you buy one full-price item. This is an example of a nice incentive to shop that is attractive to a buyer and provides a little extra perk. On the other hand, we have all had that Amazon Prime experience where we’ve been thrilled to find a graduation diamond necklace for our niece at 50% off, only to have the chain break the second we take it out of the brown package. And on closer investigation, the “diamond” reference in the product description was in air quotes, and it’s actually Swarovski crystal. And with that, you are now making an emergency trip to the jewelry store at the mall at the last minute, like you now wish you had done in the first place, lest you give your niece a present that makes her look like a rip-off version of a Kardashian. When it comes to B2B, the 50% off necklace phenomenon shows up in the form of desperate companies who are offering rock bottom discounts, not just price breaks, because their product isn’t up to snuff, or because they want to distract you with such a low price so that you won’t ask too many questions about the product details and will just sign on the line, delighted to go report to your CFO the wonderful bargain you’ve negotiated. And sometimes, a discount is just a discount, and you should grab it while it’s hot and save that money. So, how do you know which is which? What’s a year-end buyer to do? How are the industry’s most savvy buyers handling their end of the year spending? This seemed like a very delicate problem, so we wanted to poll our community and help you figure out how to handle your end-of-the-year budget in a way that will be most cost-effective and truly set you up for success in the new year. Here’s what they had to say. Hope it is helpful! These are both thoughtful approaches. And overall, saving money is always a good thing, right? Or is it? We decided to dig deeper and ask our community where buyers should draw the line. When is a price reduction a positive thing, and when is a deep discount more of a red flag and less of a revenue-saver? Sales Hacker commentary: We conscientious budget shoppers have all fallen for a Black Friday deal gone wrong (we at Sales Hacker may or may not be harboring a defunct Roomba or an inflatable unicorn that never actually inflated) but while falling for a bummer Amazon Prime deal can cost you a small chunk of change, a bait-and-switch purchase at the business level can be much more painful, expensive, and even catastrophic. Learn from Deb’s disaster and if something seems too good to be true, it probably is! 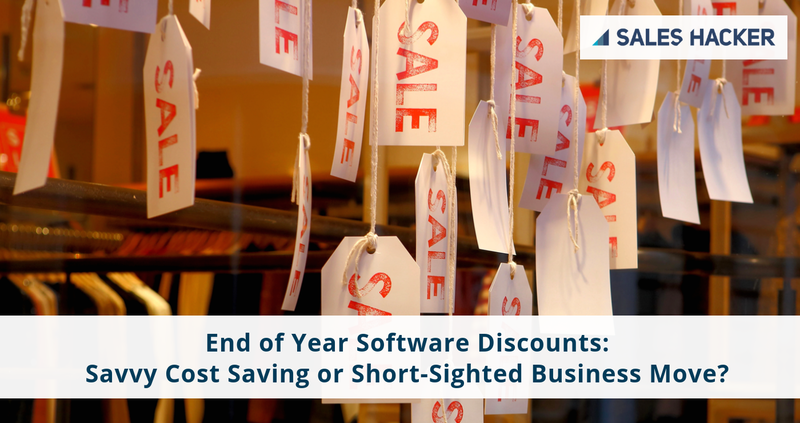 Erica Stritch, VP of Marketing at RAIN Group, also shared a tale of a deep discount gone wrong. “A few years back, we were reevaluating our list/business information provider,” said Stritch. “While we were happy with our current provider, they were increasing prices and we’d been getting many offers and solicitations from competitors. We took a few demos and ultimately decided to switch to a competitor who seemed to have similar features and validation processes, but was giving us a highly discounted rate that would be half of what our current provider was offering. We integrated the new technology into Salesforce.com only to realize one of the features we used the most with our old provider did not work with the new provider. It created a ton of manual copy and pasting to get the data from the provider into the Salesforce.com record, while it used to just take the click of a button. The disappointment really set in when we launched our first marketing and sales campaign. While we typically got a 70% delivery rate with our old provider, our first campaigns were getting about 40% delivery using the data from the new provider. The data was old and not validated the way they described in their sales pitch. Sales Hacker commentary: Collin is correct! If something sounds too good to be true, it is often the case. We all understand the desire to future-sell — you definitely want to let your prospects and customers know if a feature they really want is in the works — but it’s a fine line. Don’t get too ahead of yourselves as salespeople and overpromise too much. Even if you have the best intentions and just really want to get them excited, over-selling will ultimately create a negative customer experience and perpetuate a negative stereotype of salespeople. In conclusion, Rosen said he has to think about the bottom line. “My general thought process when buying is ‘Will this tool help our productivity and bottom line? If yes, how much effort will it take to implement? Do I believe the team will adopt the tool and benefit from it? Does the price align with our budget and perceived value?’ “ If the answer is yes to all of the above, Rosen says it’s a winner. Sales Hacker commentary: It is safe to say G2 Crowd knows a thing or two about the best sales software, so we trust their advice is good advice. Brad makes some great points. While it is tempting when your CFO is breathing down your neck to go for the cheapest option just to increase your chances of getting the budget line item approved, that same CFO is going to come back to you in a few months, asking you to prove the ROI. So remember to focus on overall value — Price absent the context of value is meaningless. $1 per user per month is too expensive if you make $0.50. $1,000,000 per user per month is cheap if you make $100,000,000. So, don’t be penny wise and pound foolish. If the increased expense in the beginning will be easily justified by the end results, that’s one thing. On the other hand, if the other product is more expensive and you can’t find a good reason why, of course, go with the less expensive option.Save money where it makes sense to save money. Just make sure you check under the hood, as we discussed in the feature parity section. There you have it, straight from the source! We hope you enjoyed this Sales Hacker Community round-up and that you have a little more clarity about your end-of-your-spending! Get value, save money, and don’t end up with a Kardashian necklace, and you’re good. Originally published at Sales Hacker. We provide world class thought-leadership, webinars, conferences, online courses, sales training & digital partnerships. Step up your sales game today!